So many rich memories from Awaken the Dawn conferences flood my mind: life-changing encounters with the Lord; divine appointments; deep fellowship with other believers; and opportunities to serve fellow brothers and sisters in Christ. The first ATD in 2005 is interwoven into the very core of my prophetic history in the Lord. It is a link that will forever be a part of my narrative in the Lord. For that I’m eternally grateful. For a few years my wife and I served in the hospitality room for the guest speakers at ATD. We met so many wonderful leaders. I will forever cherish some of those connections which continue to this day. I remember the first time Allen Hood came to ATD. I encountered the Lord powerfully at the altar after he preached. I was undone. A dear brother came over and wiped the snoot as it slung down from my nose (sorry for the graphic description! )—I was a wreck before the Lord. And forever changed. I have so many other sweet memories. Too numerous to list here. But I do want to personally invite you to ATD 2015. This week the Fredericksburg Prayer Furnace is hosting Awaken the Dawn. This annual conference in Fredericksburg, Virginia is slated to kick off this Wednesday, April 15 with the Ferguson Response Virginia at 7pm. This will be a time to address the racial division that’s become a flashpoint in our nation today. 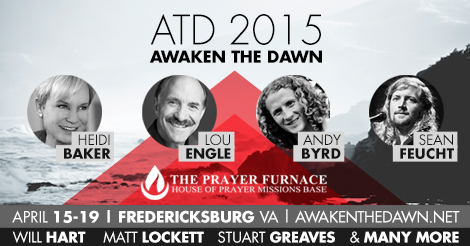 Jonathan Tremaine Thomas, Stuart Greaves, and Lou Engle will lead the charge for this session. From April 15-19 (Wednesday-Sunday), there will be multiple anointed speakers. Such include: Lou Engle, Andy Byrd, Heidi Baker, Matt Lockett, Will Hart, David Bradshaw, among others. My friend Darrian Summerville will also minister. Indeed a powerful lineup.